The data item “Age (as at 1899)” indicated the approximate age of the nurses for whom this information was known. It did not indicate the age of a nurse at the time of her service, as exact dates of service were not known, nonetheless, with the Boer War only lasting three years it gave a good approximation to allow for the examination of the age of the cohort of nurses as a whole. The main data source for the ages of the nurses was the census. As has been discussed earlier, this only gave an approximation of age. An example of the disparities caused by census data is Sister Alice Louise Von Dix. Her age varied on the census when seen as a series: On the 1871 census her age gave a birth year of 18701; On the 1881 census her age gave a birth year of 18712; On the 1891 census her age gave a birth year of 18683. For analysis the mean age was used. Other sources for the age of nurses included newspaper articles, diaries and other ephemera. 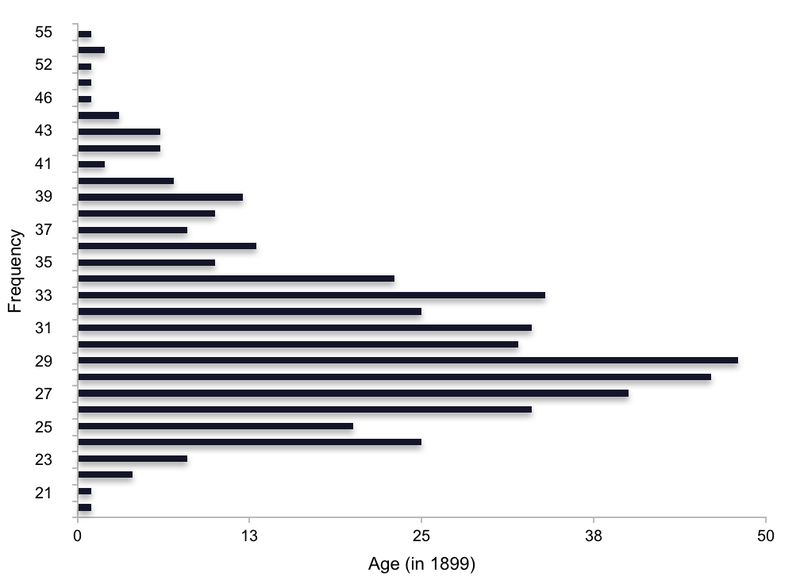 The majority of the nurses in this dataset were in their late 20s or early 30s. This was not surprising as most women would not have entered nursing until they reached 21. They would have undertaken a course of training which may have been between two and four years depending on where they trained. Clearly some volunteered for service at the earliest opportunity. Those aged 20-22 are likely to have been in training in 1899 and would have gone to South Africa when their training was completed. The range of ages discovered in this dataset was in line with that prevailing in civilian hospitals of the time. A number of historians have looked at the ideal age for women entering nursing as expressed in handbooks and advertising4 and in the prevailing social norms5. The age for entrance into nursing appeared to have been 25 as this was the age at which women would also have expected to enter marriage, and it was also thought that younger women would not be physically or emotionally strong enough. It was evident from the Boer War nurses dataset that many had entered the profession before the age of 25, as they were qualified and enlisted in their mid-twenties. Hawkins6 found that there was a trend toward younger nurses during the Victorian period generally, and that there was some concern that younger nurses were taking posts and positions that could have been expected to have been given to more experienced nurses. There was evidence of relatively young nurses having positions of responsibility in South Africa. Eleanor Lawrence enlisted in the Princess Christian’s Army Nursing Service (Reserve) in January 1900 and became the Superintendent of the Princess Christian’s Hospital at Durban. She was aged 30 and although she was a relatively experienced nurse she had not held this level of responsibility before.